At the unusual set of holiday parties I normally attend, this year’s discussions have all been about how to best deal with the threats to democracy and security that the election of Donald Trump and the rise of the new right in Europe have led to. I kept hearing two tough questions which I have been thinking and worrying about for decades. How, on the one hand, do we effectively say “no” to the policy mistakes and injustices we see happening all around us? How, on the other hand, do we do so in a way that allows us to work together with at least some of the people we disagree with so we can find constructive solutions to our problems? In my life as an activist and a peacebuilder, I’ve tried to do both, but, like many of us on the left, have often found the two goals hard to combine. However, combining the two goals has taken on new urgency in the last year or so since many of us have come to the conclusion that we have to do both but don’t really know how to blend the two. Like most of my fellow party goers, I’m pretty angry with what’s going on in Washington and in other world capitals. As angry as I am, I also realize that the many problems we on the left will not be able to solve any of the underlying problems we face on our own. If, as a side effect of saying “no” to what we deeply disagree with we also make it harder to work with people who did not vote the way we wanted last November, we aren’t likely to make much headway in actually solving the policy problems we face. In dealing with the current crisis in the United States, however, pacting will have to go beyond just the elites. 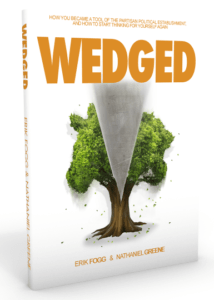 As the likes of Eric Fogg and other better-known pundits are right, the entire country has been “wedged” into what look like two, wholly opposed camps. 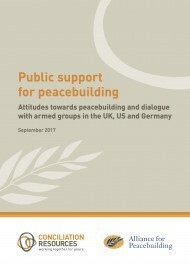 If Fogg and a poll we did at the Alliance for Peacebuilding are right, we are actually not all that divided on many key issues. Although few of us use terms like pacting (thanks goodness), I think we are beginning to make some progress in moving in that kind of a direction—with the emphasis on some. At recent meeting with people from the International Center for Nonviolent Conflict and in discussions with Silicon Valley innovators, everyone has been using the word disruption. ICNC colleagues talk about the need to disrupt the political status quo and replace it with something better. At the same time entrepreneurs draw on the work of Clayton Christensen and others who stress the value of disruptive innovators who both destroy existing companies (e.g. Kodak) but provide better alternatives in so doing (e.g., smart phones) because they also meet broader, previously untapped needs. We are also beginning to have pacting like discussions that span these two communities and their somewhat different understandings of disruption. My colleagues who work for organizations like ICNC understand more fully than ever that we have to provide credible alternatives that will appeal across the ideological board. My politically more conservative friends understand that creative disruption has to shake up the clichéd applecart while also meeting other people’s needs. In short, many of my friends on the left are thinking about how they confront evil and then deal with most of the people who at least tacitly supported such views afterward. Meanwhile, many of my more conservative colleagues now realize that we have to disrupt parts of political as well as corporate life. Increasingly, too, we also realize that solutions to the problems we face amount to superordinate goals that can only be addressed effectively if all of its stakeholders work together to find a mutually beneficial, win/win outcome. In short, I have a gut feeling grounded in personal experience that we can both say “no” and create a space in which it becomes easier for people who disagree to work together. But, I would be lying if I said I knew how we can all do so. As a result, I invite you to participate in the forum section of my web site which I created precisely to be a venue where we could have these kinds of difficult discussions.